Fast and flexible laser-scanning microscope. High frame rate. High sensitivity. Bliq Photonics’ Video-rate Microscopy System (VMS) is a robust and flexible laser-scanning microscope built for speed, precision and versatility. The VMS features a high-speed polygonal scanner coupled with sensitive detectors, with a video-rate acquisition speed of 30 FPS (frames per second) at 1024 by 512 pixels and up to 480 FPS at 1024 by 32 pixels. These extreme scanning speeds are ideal for in vivo imaging applications that require high temporal resolution such as calcium imaging, optogenetics and blood cell behavior. As opposed to resonant scanners, the VMS’ polygonal scanner provides a constant linear scan and superior precision of laser positioning offering a larger field of view. With up to 9 sensitive MultiAlkali PMT detectors, you will not miss any relevant information. Additionally, each VMS comes with a reflectance APD detector that provides extra structural information about your sample. Bliq Photonics’ convenient acquisition controller handles enormous amount of data in real time. Bliq Photonics’ VMS is built for both speed and sensitivity. The VMS is therefore perfect for imaging fast and dynamic events (in vivo and ex vivo) as well as signal coming from a continuously moving animal or tissue. There is a wide array of applications for this system. Rapid volumetric imaging using Bliq Photonics’ Axicon module. It’s not just an imaging system, it’s your tailor-made and personalized microscope. Purchasing a microscope is an enormous investment of time and money, but Bliq can help. 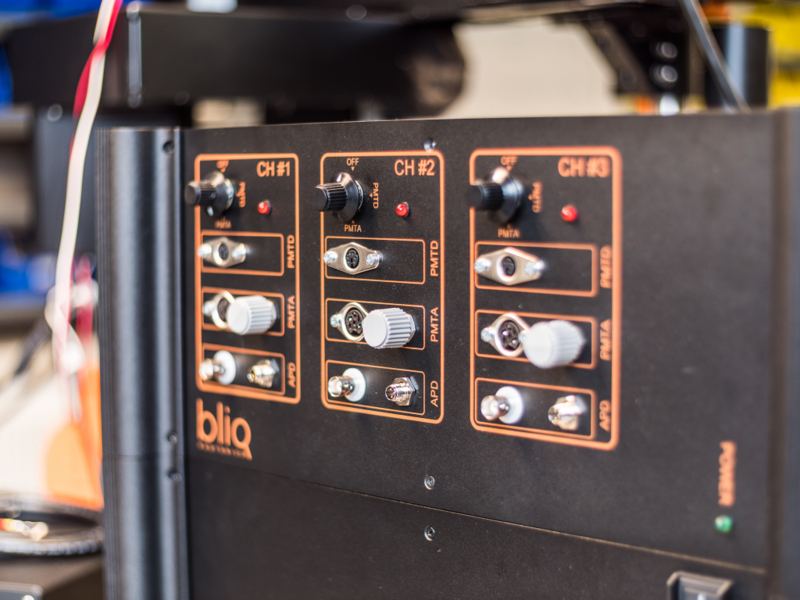 Bliq has the expertise to facilitates the specification of your new instrument and the technology to ensures you receive the most value for your investment. Custom mouse holder for brain imaging. * Note that the components included in this section are examples that have successfully been built by Bliq. Special requirements for many of the components can easily be met. Ask us how we can create a system that will best fit your needs.